After working on this project for the past couple of days, I was finally able to fit everything neatly onto a printed circuit board. The breadboard is great for testing an idea, but the wires can get a bit messy as the project becomes more complex. 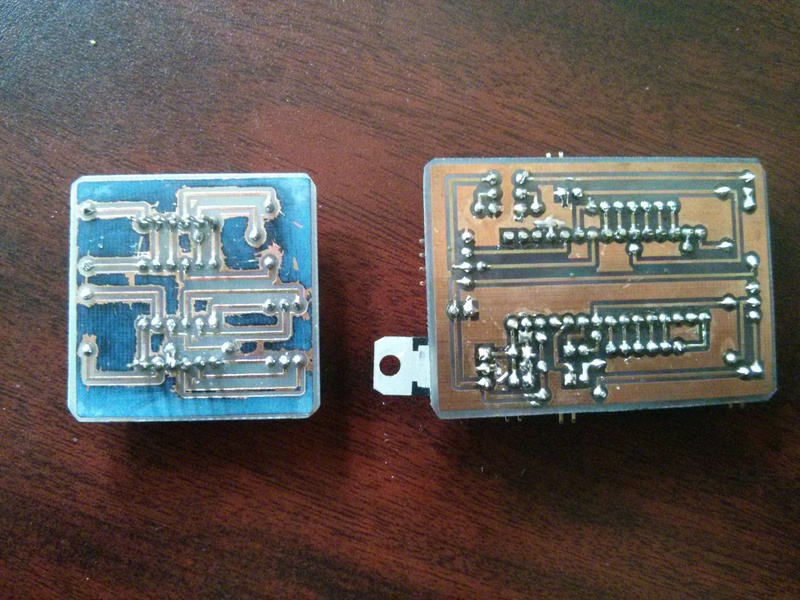 I etched the PCB boards using the tonner method for the mask and ferric chloride as the etchant. With that said, there are a couple of changes I made to the wiring itself. 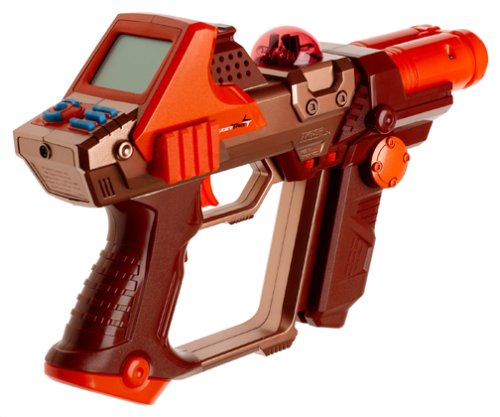 Most of these changes were made to allow components to fit better with the laser tag gun. 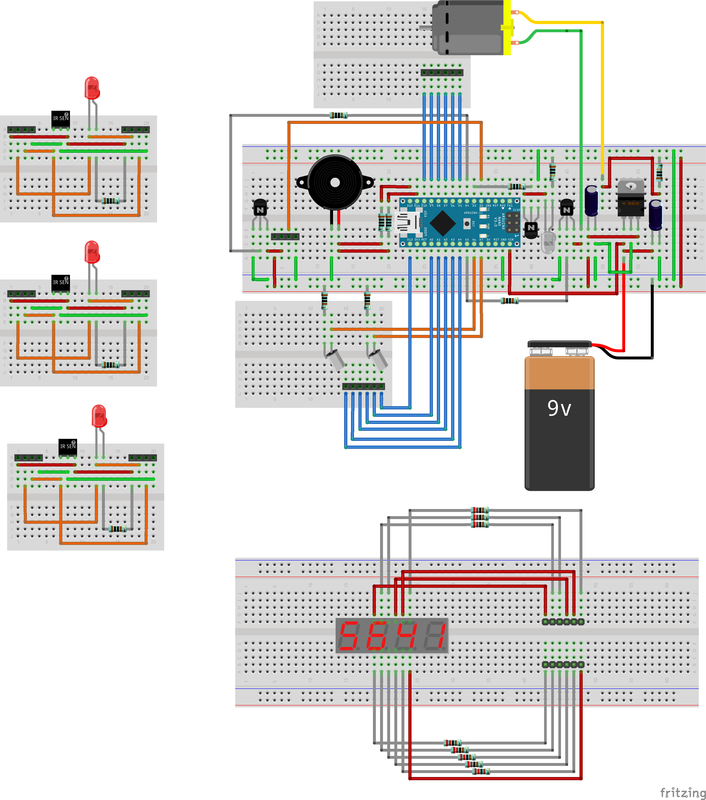 The process of making these boards begins with a breadboard diagram. 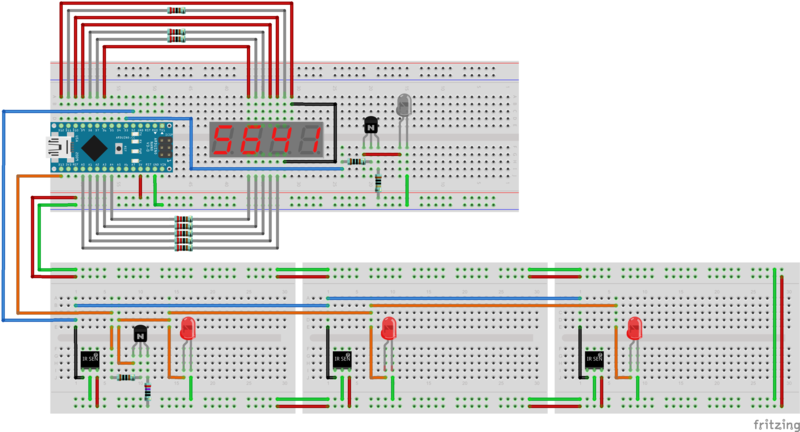 Next, a wiring diagram was made from the connections on the breadboard. It makes the wiring connections easier to read. 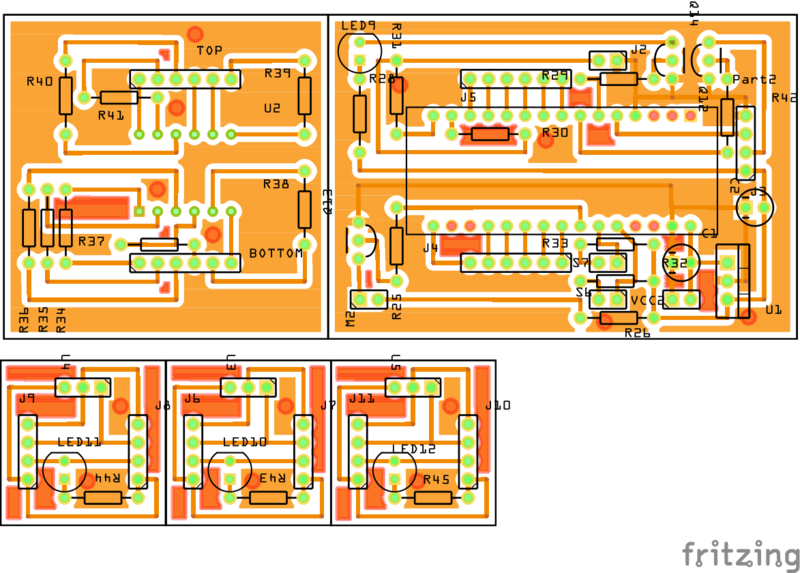 Finally the PCB board components were laid out. I used a ground fill to save as much etching as possible. For the past few weeks I’ve been taking a break from my laser tag project to put together my Mini Kossel 3D printer. It took a while for me to get it working, but the final print result turned out well. I purchased this printer a few months ago from an on-line company called Mixshop; there was a long delay in their lead time, but they did deliver the product in the end. I basically followed their Kossel Manual for the assembly which is pretty good, but I find their instructions to be somewhat incomplete. One of the issues I encountered with my proposed setup in Update #1 is that the LED segments will periodically dim. This was because I only used one resistor to power all 7 segments (8 including the dot) in parallel. This would work if all LEDs in the display were manufactured the same way. However, it’s more likely that some LEDs draws more current than the others causing some segments to become slightly brighter while the others dim. The better way to connect the LEDs is to have a resistor after each one. I used a 2K Ω resistor after each segment so that the current flowing through each LED remains low. This hardware configuration worked out a lot better for me. All the LEDs remained at a constant brightness. I also managed to get the IR Sensor an the IR LED working at the same time. My test code for this setup is shown below. 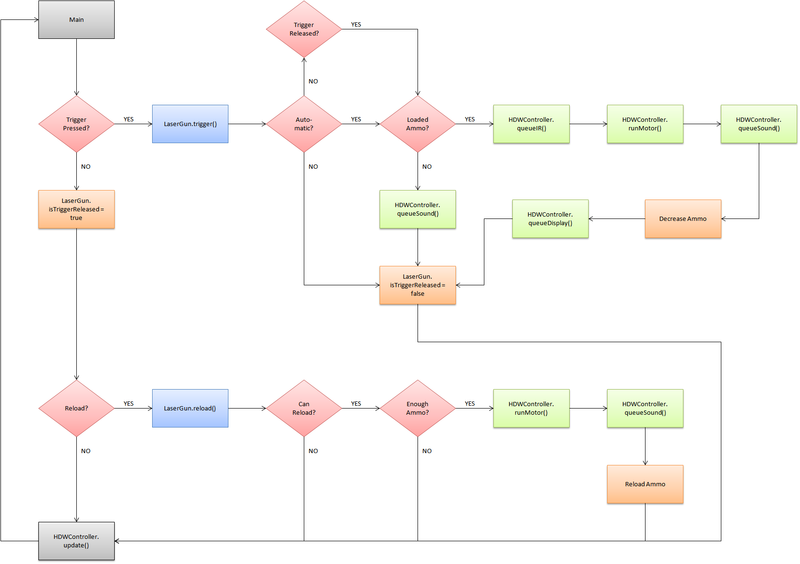 Over the holidays, I started drawing a flow chart diagram for the software portion of the Arduino Laser Tag project. 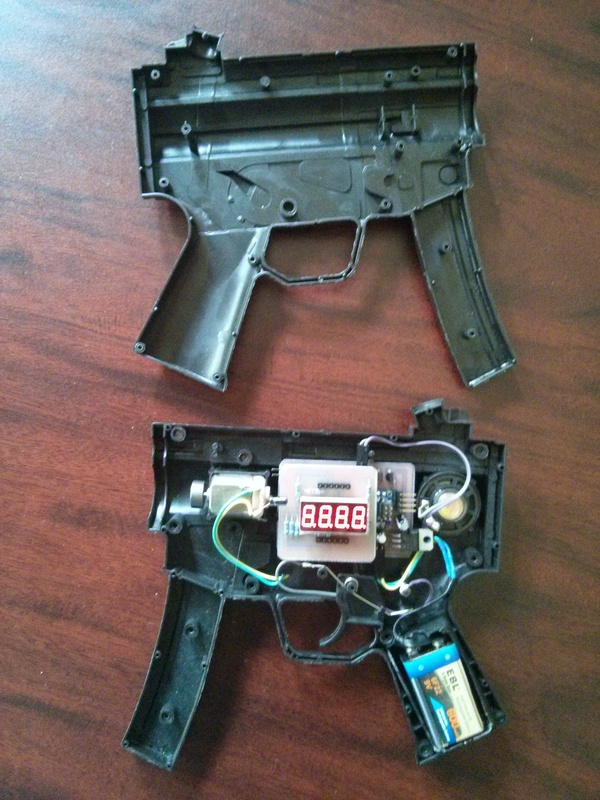 The idea here is to use software polling to detect the trigger and reload buttons instead of using interrupts. I wanted to get around the issue of the interrupts incorrectly detecting the release of the trigger due to the debounce of the buttons. The HDWController will be a new class created to manage all the hardware components (motors, speaker, IR emmitter and sensor). The LaserGun class will be more of an abstract class that will queue certain tasks for the HDWController to perform. You can view the Excel spreadsheet of the flow chart here. 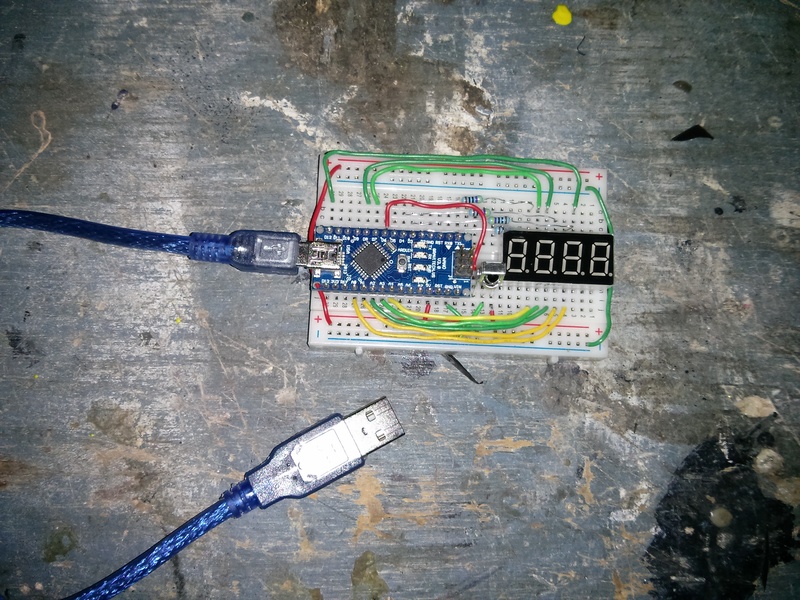 As part of the prototype for laser tag project, I’ve put together a Universal IR Infrared Receiver TL1838 VS1838B working in conjunction with a 4 digit 7 segment display I brought from Aliexpress. I am working towards building a testing platform to something similar to the schematic I’ve drawn below. 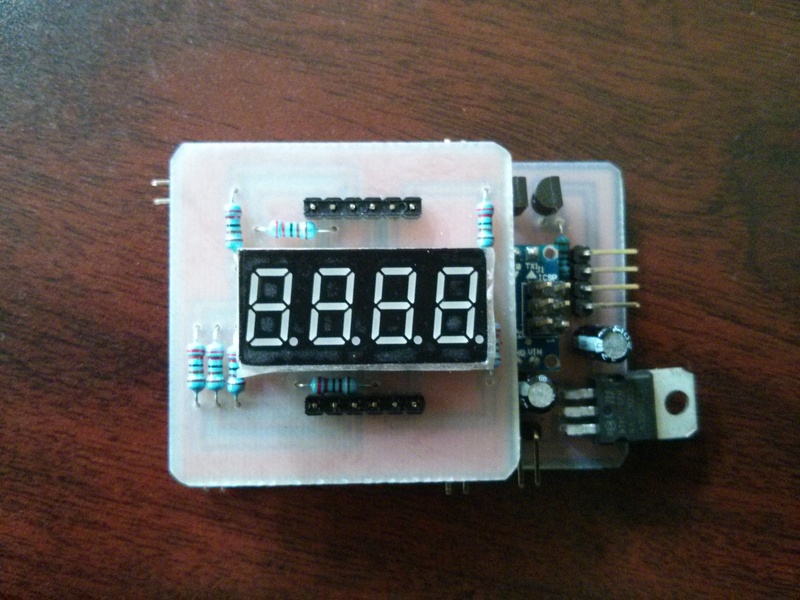 We decided to go with a 4 digit display for flexibility in game programming. Mostly likely, the first two digits will be used for health and the last two will be used for ammo. The three IR Sensors on the bottom with their respective LEDs will eventually be attached on to a vest and linked back up to the gun. 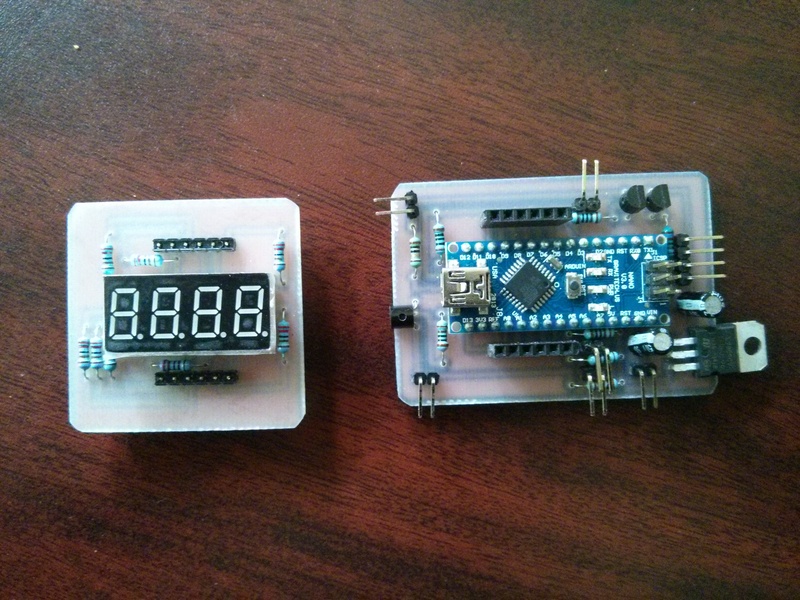 The IR sensors were tested with the Arduino Nano and the IR detector library from Ken Shirriff’s Blog. It was successful in detecting my remote control from a distance of more than 10 meters away. 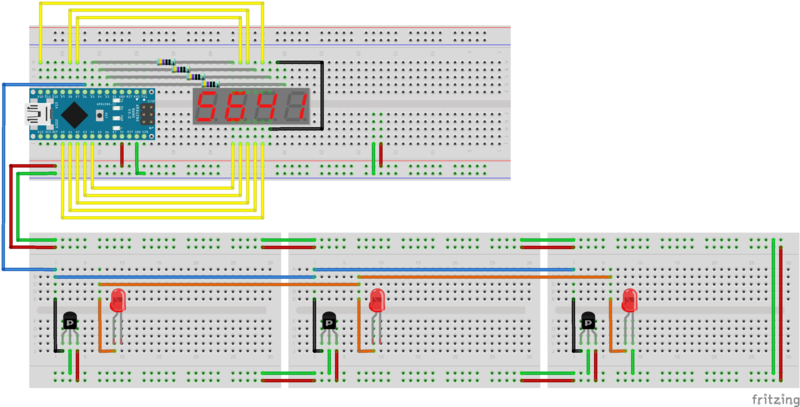 The testing code for the IR sensor and the 7 segment display is shown below. 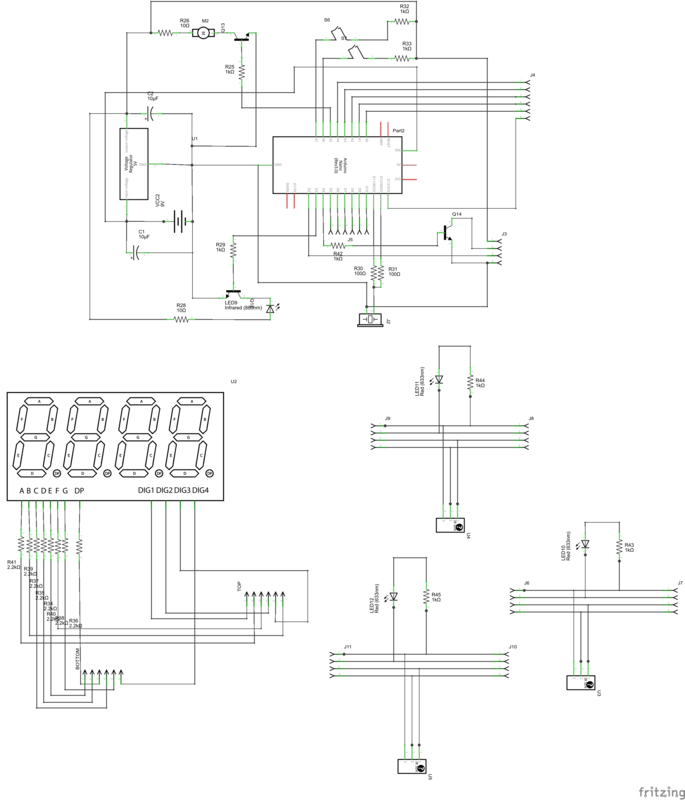 The hardware setup of the 7 segment display was a bit complicated because I couldn’t find the specifications for the pins. I had to test each individual segment myself. If anybody is having trouble figuring out where the common anode is, you can refer to my spread sheet here. For the past few months, my friends and I have been planning to make our own laser tag system that we can play at home. The goal is to make a laser tag system that we can modify and program different game modes. Why are we doing his? We just want to play some laser tag, and learn a couple of things along the way. Remote control infrared operates at 38 kHz, which is very uncommon in nature. 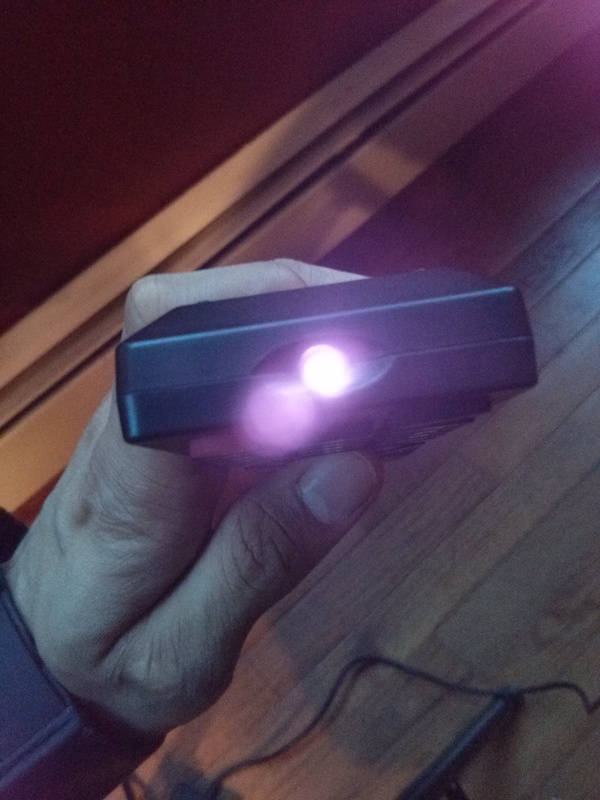 For our Laser tag set-up, we will be using infrared at the same frequency because it is a common standard. The core idea is very simple, have guns that fire off infrared and attach sensors on vests that can detect them. 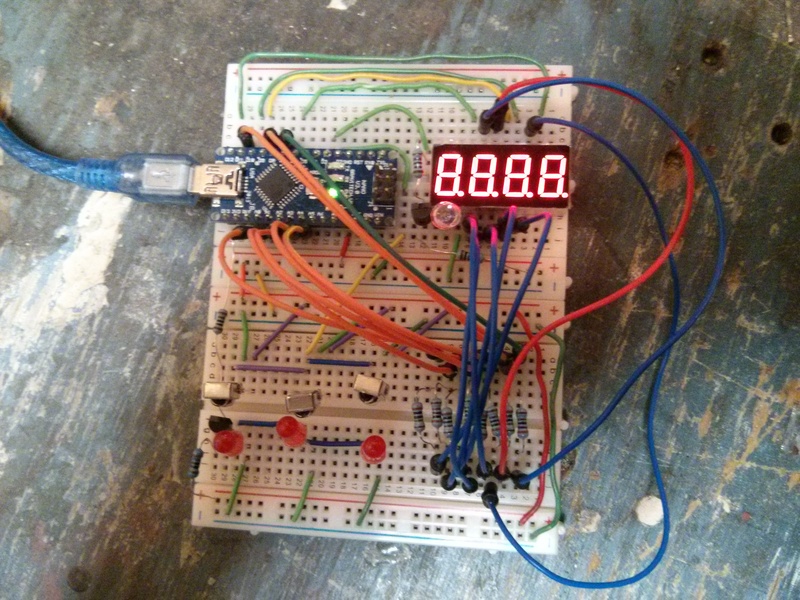 The logic will be handled by a programmable micro-controller. In our case, the Arduino. Since we will be making several sets of guns, we decided to prototype one first, then mass produce the others. Here is our bill of materials for the first laser tag set, just to get us started. Most of the parts were from China so we expected at least a month of lead time. Good news! The Xtruder project is complete and PLA filaments were made. I am in the process of trying out different kinds of plastics. The extruded filament turned out to be to brittle. I will post more details about the project very soon.